- Click on the + sign or "other searches" to the right of the search box to begin an advanced search. - On the next screen, leave the search term box blank to find all items. - Choose a time frame (last week, last month, etc.) in the "search by date added" line. - In the Filters section, click on Libraries to choose Young Adult or Juvenile titles. If you have any questions, please ask us at the library, at 734-439-1240, or info@milanlibrary.org. Teens nominate and select their favorite books of the previous year to create the Teens' Top Ten list. YALSA (Young Adult Library Services Association) announces the winning titles during Teen Read Week in October of each year. See this year's nominees and winners here. See the 2016 nominees here. The winner will be announced in October. 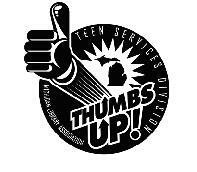 Click here for more information about the Thumbs Up! Award and previous winners in our library here. Do you like the Hunger Games trilogy? Try this list for similar books. Do you like the Dork Diaries? Try this list for similar books. Do you like The Fault in our Stars? Try this list for similar books.